It’s widely accepted that baseball is America’s pastime, but for many people baseball starts and ends with the major leagues. However, there are over 150 teams plying their trade in the minor leagues. In 2016 over 37 million spectators attended a minor league baseball game. But not all minor league towns are the same, some offer things like affordable homes, while others offer on-field excellence to wow the crowd. 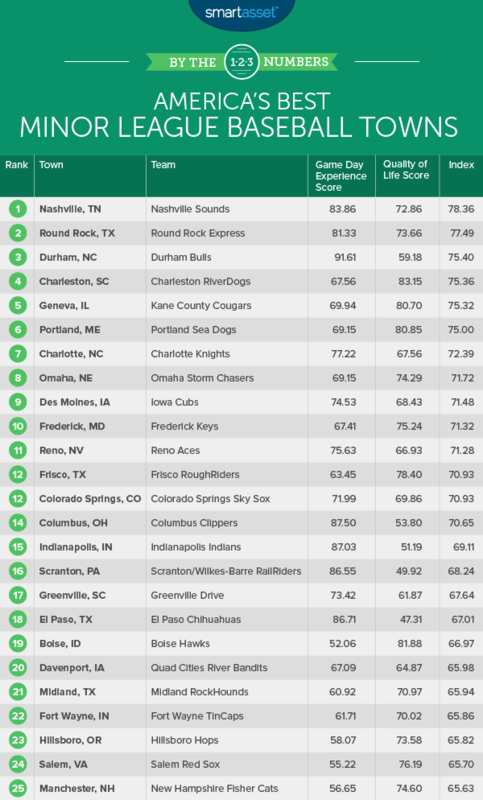 Below we rank the best minor league baseball towns in America on those and other metrics. Looking to buy a home? Check out the latest mortgage rates. In order to rank the best minor league baseball towns in America, we looked at data on 159 towns. We compared them across quality of life metrics and game day experience. Read our data and methodology section below to see where we got the data and how we put it together. 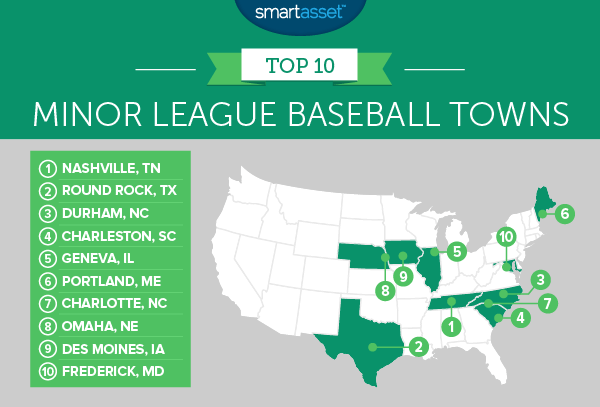 This is SmartAsset’s fourth annual ranking of America’s best minor league baseball towns. See the 2016 ranking here. Wide range of experiences – Within our top 10 you have a wide range of game day experiences. The Durham Bulls, for example, have a score of 91 for game day experience. On the other hand the Charleston RiverDogs only got a 67. Consistency – There were six repeat performances in the top 10 this year. Nashville Sounds, Round Rock Express, Charleston RiverDogs, Portland Sea Dogs, Charlotte Knights and Iowa Cubs all kept their spots in the top 10. 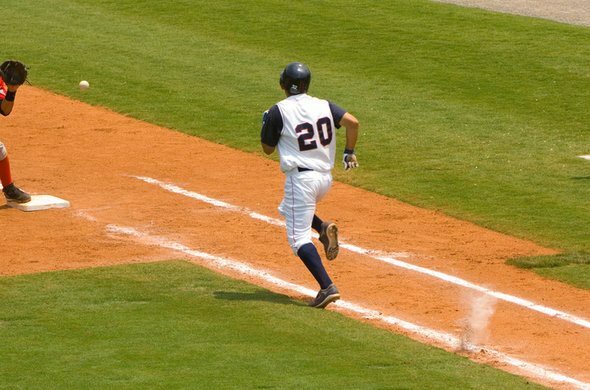 Tennessee split – Nashville topped this year’s list but Tennessee is also home to three of the lowest-scoring minor league baseball towns in America. Cities like Greeneville, Elizabeth and Kingsport have low quality of life scores. Combine that with lackluster on-field performances from their respective teams and you have a recipe for a low-scoring minor league baseball town. Nashville, and the Nashville Sounds, secured the first spot in this year’s study moving up two spots from last year. One plus for Sounds fans is that the game day experience score rose from 77 points on our index to 83. The improvement in game day score is due to the increased average attendance numbers. The Nashville Sounds went from filling 77% of their seats in 2016 to 89% in 2017. In fact the 8,800 fans who show up on average gave the Nashville Sounds the fourth-highest attendance in our study. Nashville could improve on some quality of life metrics. While the unemployment is only 3.1% – a top 10 rate – the city does have relatively high crime. Nashville ranks in the bottom-half for both property and violent crime rates. Round Rock lost its title as best minor league baseball town. But second is nothing to cry about. In fact the race for first in this study was very close. Nashville beat Round Rock to the top spot by less than one point on our index. According to our data, Round Rock provides one of the best on field experiences in the country. The fans pack the stands with over 8,700 people attending the average Express game. Another plus to living in Round Rock is that affording tickets to see the Express shouldn’t be too difficult for the average resident. Our data shows that after paying for housing the typical household here should have about $57,000 left over. Combine that with Texas being a low-income tax environment and you have a lot of households with plenty of disposable income. The Durham Bulls are a triple A team with one of the best records in the minors. They won about 61% of their games this past season, the 14th-best winning percentage in the minors. And if there is one thing that can make a game day experience great, it’s seeing your favorite team putting up another victory. That winning tradition, combined with high attendance, gave Durham the highest game day experience score in our top 10. Baseball fans in Charleston seem to love their RiverDogs. Despite playing in Low Class A, the third-lowest league in the minor leagues, fans still flock to the stadium for games. On average just under 4,500 fans attend each game. But what makes this a great town to watch baseball is how livable Charleston is. This city has high scores in every livability metric including having one of the liveliest eating scenes in the country. According to our data, Charleston has about 19.4 restaurants, bars and entertainment establishments per 10,000 residents. In the past year the Kane County Cougars and their fans were pretty competitive on field. They won around 53% of their games in front of an average of 5,800 fans. But off the field is where Geneva shines. This is the safest city in this study, with the third-lowest violent crime rate and the lowest property crime rate. Plus, living here won’t break your budget. Our data shows that the average household should have about $77,000 left over after paying for housing, the fifth-highest figure in our study. The Portland Sea Dogs are a popular team in the Red Sox farm system. On average about 5,300 fans come out to see the Sea Dogs play their games. But Portland has more to offer than just Sea Dogs. Our data shows the city is one of the best spots to grab a beer or a bite to eat before or after the game. This city has about 30 restaurants, bars and entertainment establishments per 10,000 residents, the highest rate in the top 10. Our data seems to suggest the Storm Chasers aren’t quite as popular as they should be. Despite a respectable winning percentage of 49%, only about 5,300 fans showed up to the average game. That figure only represents 59% of max capacity. Omaha has the worst score in our top 10 in each of those attendance metrics. Perhaps one plus for Omaha fans is the fact that the Storm Chasers offer something close to major league baseball. The Storm Chasers play in the highest division in the minor league baseball system. This Triple-A club plays its game in Des Moines, the ninth-best baseball town in America. The Iowa Cubs, who represent Des Moines, are one of the most well-supported clubs in the minor league system. Our data shows that an average of 7,700 fans attended each game. Another plus to living in Des Moines is the low unemployment rate. Des Moines has the eighth-lowest unemployment rate in our analysis. The Frederick Keys play in High Class A, the third-highest league in minor league baseball. Despite not playing in the highest league, fans still love coming to see the Keys play. The Keys attract an average of 4,800 fans to each game. That number may not sound like a lot but it is actually equal to 89% of max capacity. For that metric Frederick ranks seventh. Frederick is also a relatively wealthy community. The average resident has $48,000 left over after paying for housing. Average attendance. This is the average number of fans who attended each game. Data comes from milb.com and is for the 2017 season. Average attendance as a percent of max capacity. Data on attendance for the 2017 season comes from milb.com and data on max capacity comes from www.baseballpilgrimages.com. Win percentage. Data comes from www.baseballamerica.com and is for the 2017 season. Minor league class. There are six minor league classes (Triple-A, Double-A, High Class A, Low Class A, Class A Short, Rookie). We gave cities with higher class teams a better score. Violent crime rate. This is the number of violent crimes per 100,000 residents. Data comes from the 2015 and 2014 FBI Uniform Crime Reporting database. For cities where there was no data available, we used the average from all cities in the study. Property crime rate. This is the number of property crimes per 100,000 residents. Data comes from the 2015 and 2014 FBI Uniform Crime Reporting database. For cities where there was no data available we used the average from all cities in the study. Income after housing. This is median household income minus median housing costs. Data comes from the U.S. Census Bureau’s 2015 American Community Survey. Unemployment rate. Data comes from the BLS and is the unemployment rate May 2016 to June 2017. Dining and entertainment establishments. This is the number of bars, restaurants and entertainment establishments per 10,000 residents. First we ranked each city in each factor. We created separate indexes for quality of life metrics and game day experience metrics. All metrics received equal weighting except property crime rate per 100,000 residents. We then averaged the two indexes to create our final score. We ranked the cities according to this final score. Hobbies can get expensive. Whether that is following your favorite minor league baseball team or spending each weekend skiing on the slopes. Here are some budgeting tips so you can stretch each dollar. If you do want to get serious about budgeting, the first thing you will need to do is track every dollar you are spending. Figuring out where your hard-earned money is going by hand can be time-consuming but there are some great money managing apps out there which can help. Depending on your current financial situation your budget will give you an accurate picture of where you can improve. Maybe you are spending more than you realized at the ball park. Or maybe you find out you are spending too much money eating out. By switching to cooking at home you can put some more money into your savings account and grow that emergency fund. Starting new habits can be difficult. When you are trying to perfect your budget make sure you start small. Keeping a simple, easy-to-stick-to budget will increase the chance you actually maintain it and don’t go back to your free spending days.